Hindustan Times and The Times of India lead — rather sensationally — with the two independent MLAs who withdrew support to the H.D. 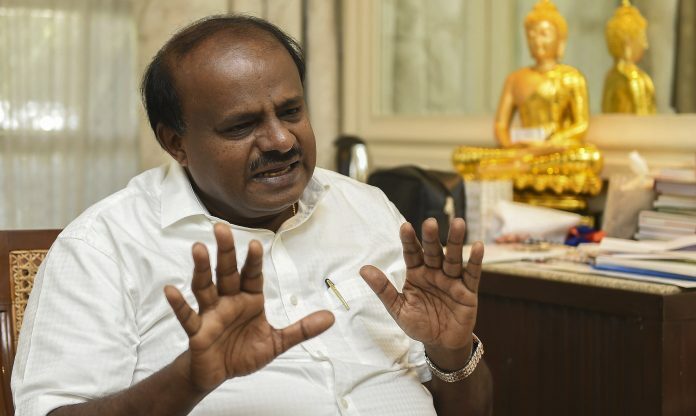 Kumaraswamy government in Karnataka. HT writes, “Two MLAs quit govt as K’taka tussle worsens”, and TOI says, “Cong, JD(S) go into huddle as 2 Ind MLAs drop support to K’taka govt”. The fear of poaching on both sides puts “Karnataka on boil” (The Indian Express). However, since this is unlikely to “destabilise the Congress-JDS alliance,” Express places it below the fold on page 1. It leads with “From July, quota in higher education across all private institutions: Govt”. “Institutions run by the Centre will have to increase their student strength by almost 25 per cent in order to accommodate the EWS reservation without affecting the current number of SC, ST, OBC and general category seats,” says the report. This is juxtaposed with an exclusive, RTI finding: “Reservation candidates are underrepresented in Govt’s upper rungs”. What to make of two newspapers, reading the same report, differently? While Express is positive in “ASER: uptick in primary reading and maths, govt schools script turnaround”, TOI writes, “56% of Class VIII students can’t do basic maths, 27 % can’t read: Report”. Both stories rely on the Annual Status of Education Report (ASER) by NGO Pratham. The difference lies in the age bracket they have selected. Express sees “a glimmer of hope” in the improved reading and maths skills of children in classes 1 to 5. TOI chooses the findings for Class 8, where the majority “who pass out … can’t do basic maths. A quarter cannot even read”. Theresa May’s “crushing defeat” on Brexit (TOI) finds space on front pages today, while the foreign press takes note of the ongoing Kumbh Mela in Prayagraj. The Guardian is awestruck by “Hindus converge for largest-ever human gathering”. “No Kumbh Mela has ever been so well funded, or so heavily promoted in the media and on billboards, invariably alongside the face of Narendra Modi, India’s Hindu nationalist prime minister,” it adds. The Economic Times rubbishes the law, saying, it “needs the bin” as it is a “clumsy attempt to muzzle dissent…it also shows the extreme testiness of the political establishment towards any criticism” months before elections. Finally, an edit on the Hardik Pandya-K.L. Rahul controversy: “In late cuts from BCCI”, Business Standard, rightly, criticises the Committee of Administrators for the “feud”, “bizarre arguments” in “icy emails” between its members Vinod Rai and Diana Eduljee. It castigates them for making “a spectacle of themselves” but adds they have given the public almost as much entertainment “off field” as there is on it. It was all over but for the shouting by 9 pm, Tuesday. From Times Now to sobersides NDTV 24×7, exaggerated claims and gut-wrenching disagreements had already given viewers enough to chew on by the time Arnab & Co. came to the party. At 8 pm on India Upfront, Rahul Shivshankar demolished the Opposition. With gleeful headlines, “Gathbandhan imploding”, he cited Congress’s problems in Karnataka, and advised viewers to avoid voting for the Opposition alliance. It was “a recipe for disaster”, it was an unpalatable “khichdi” —traditionally, khichdi is a comfort food meant to soothe irritated digestive systems but Shivshankar clearly knows something we don’t. And that something was revealed in his “super scoop” — Finance Minister Arun Jaitley’s blog. Figures from the latter claimed that coalition governments had consistently failed on the economic front — even Vajpayee’s NDA. By comparison, it was “best under Modi… a decisive PM”. Shivshankar said a GDP of 7.3 per cent and an inflation figure of 4.6 per cent were the best under any recent government. Shivshankar seemed to have forgotten that Modi’s government was also a coalition government and that the GDP figures he quoted for previous governments have been contested. Mirror Now discussed the Karnataka’s coalition political crisis too in “Operation Lotus”. It detailed BJP different plans in the “power tussle” — “Crush the Cong-JDS” or, alternatively, “reduce” its numbers and form a BJP government instead. On NDTV 24×7, Sreenivasan Jain did a Reality Check on the sedition case against Kanhaiya Kumar, and found it questionable. He was not alone. Former DGP Maxwell Pereira agreed that based on media reports of the Delhi Police chargesheet, there was no case for sedition. He was “very unhappy” with the way the case had been handled and uncomfortable with the timing of the chargesheet. Anima Sonkar (Akhil Bharatiya Vidya Parishad) wasn’t listening to Pereira. She claimed she was “an eyewitness” to the events of 9 February, 2016 at JNU that have led to this chargesheet. Jain repeatedly asked her that since she was there, could she tell him what precisely Kumar had said on that day. Sonkar couldn’t say. She claimed there was “slogan shouting …” and if it wasn’t Kumar who made seditious comments, it was Umar Khalid. But what did he say, Jain asked, again. Sonkar couldn’t say. Instead, she attacked Jain: “I can see the desperation on your face…” That riled Jain: “Be careful what you say,” he warned.